Guess what? I am done. 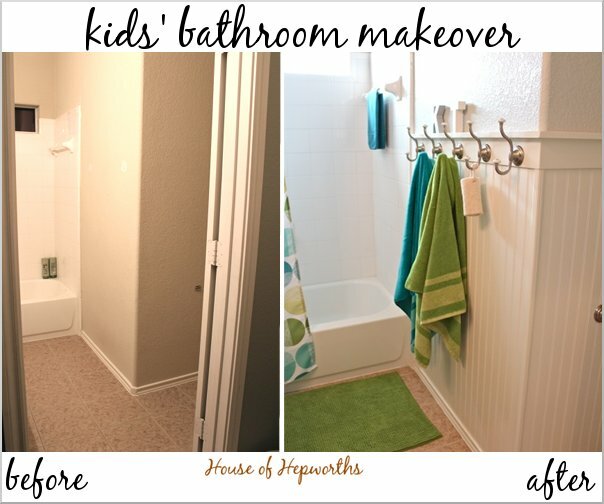 D-O-N-E with the kids’ gender-neutral bathroom makeover! Well, done enough. I still need some art for a wall or two, but for now, I’m calling it. I stayed pretty true to my original plan, but I did change a few things which I’ll get to in a minute. Before-and-Afters are my favorite, so let’s just start off there. No point in dragging it out and keeping you in suspense. You are welcome. I am super obnoxious and labeled each before and after photo just in case any of them pop up on pinterest. I am so stoked with how this room turned out. And I’m even more stoked that I was able to pull this room together in about a week. Fastest makeover ever. Pat on the back to me. So, what the heck did I do? First off, I painted the walls a Martha Stewart color called Heavy Goose. It’s the same gray that I painted our office. I chose this color because it’s a really light gray and I already had some in my garage. Win/win. Double prizes! I also hung all the beadboard and framed out the mirror. 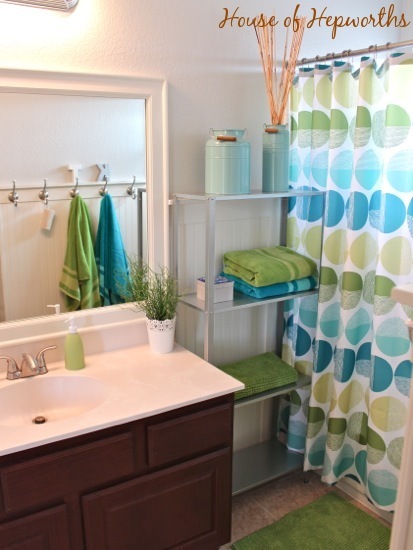 I started with the shower curtain as my main color pallet and inspiration for the room. It’s hard to find a curtain that is gender-neutral that isn’t too boyish or girlish. Fortunately my daughter is crushing on blue at the moment, so she loved the curtain. I found the wooden block letters at least a year ago either at Target Dollar Spot or HobLob. I can’t remember. Eventually I’ll paint them some fun bright colors, but they are cute none the less sitting on the little ledge. Great easy way to label who’s towel is who’s. And I’m still geeking out over the robe hooks. I just love the little white beads on them. 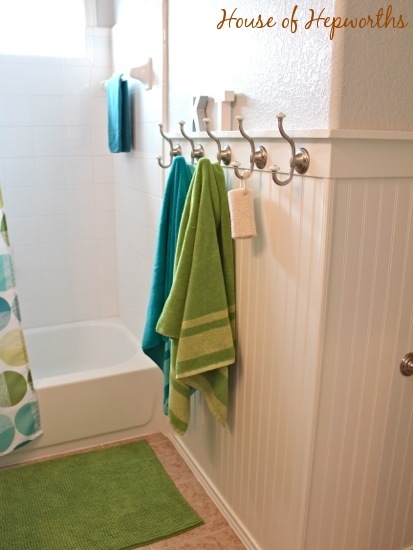 They go so well with the beadboard. I added a bit of moulding around the window above the tub just to frame it out and make it more finished. I don’t plan to put a curtain on this little window, but the moulding really helps to make it pop. I still can’t get over how much of a difference this mirror frame has made. And it was such a simple DIY project. The white frame and white beadboard and white counter look so crisp and fresh against the pale gray wall with the pops of teal and grass green. The room is such a fun space now, especially considering how much of a dungeon it looked like before. It was dark and boring and depressing, but with a little color it’s now fun and ready for kids to splash around in. The toilet area is still a bit unfinished. 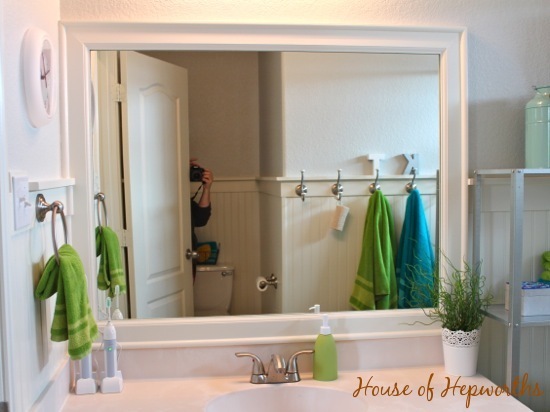 I was going to hang some rustic floating shelves above the toilet, but the more I think about it, the more I feel I should hang a cabinet with doors. As the kids get older they will need somewhere to store all the toilet paper and hygiene products. I don’t want them to feel embarrassed by having personal stuff like that sitting out. Getting a cabinet is now on my to-do list. Original mood and inspiration board for the room. Hanging beadboard and trim tutorial. How to frame out a mirror. Painting beadboard and a hardware source list. wooden K and T: craft store? And just because I’m so dang proud of this room, here are the before and after pictures again! Yippie! I hope you enjoyed this little makeover. If you have any questions ask in the comments and I’ll answer them in the comments section as well. « Associated Press – HoH is in dozens of newspapers across the country! Great job! 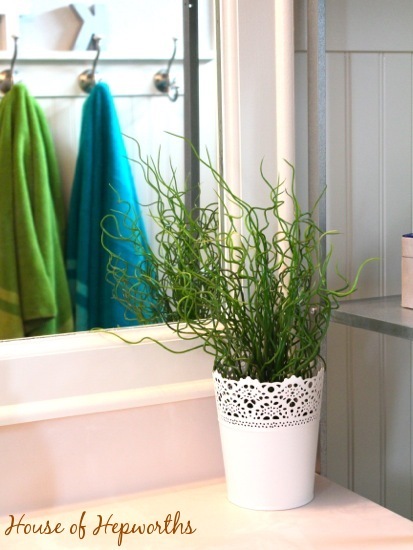 You make me want to add beadboard to my guest bath ASAP! It looks wonderful! 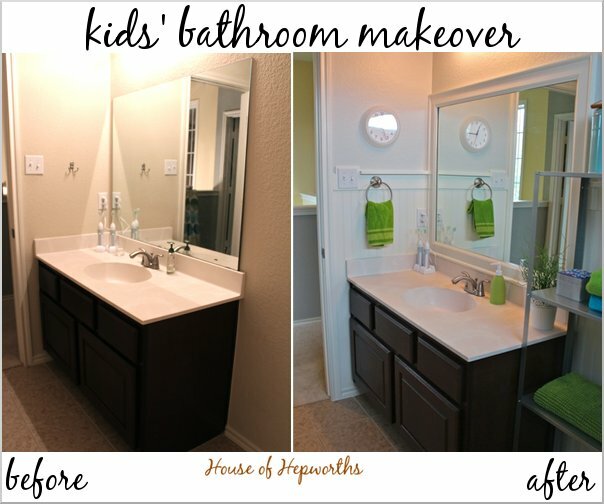 I love seeing a kid’s bathroom that isn’t covered in characters 😉 I have to ask a dumb question – did you do anything to the wood on the vanity? Or is it just the difference between the before pictures taken at night, and the after pictures taken in daylight? Either way, looks amazing! Love those colors together!!! 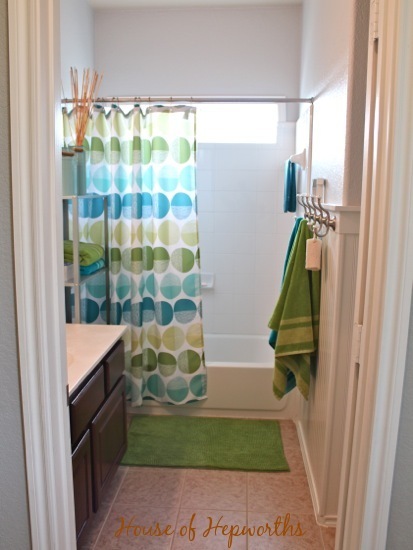 Love that bathroom! 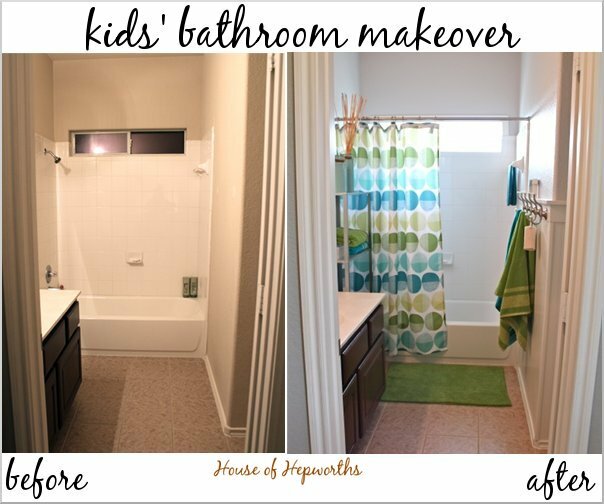 What was the kids reaction to their new bathroom? I love it, makes me wish I had the patience to try even just the mirror molding. I LOVE it! Such a huge change with mostly just some elbow grease. (and does it make me a horrible person that my favorite picture is the before/after of the mirror shot . . . with you hiding behind the door?)! That was fast! It looks great – so fun and bright! I’m sure the kids love it! 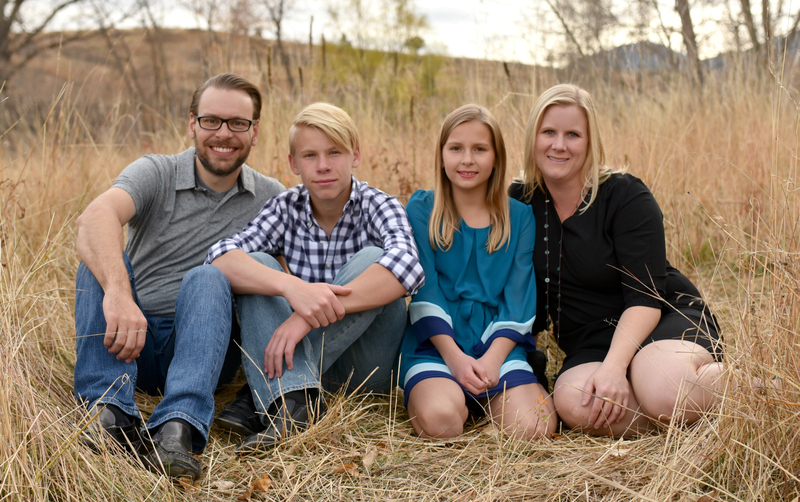 Allison, you deserve to be giddy after all that work & such a great space reveal! I love the color choice–whether young or old kids will be using it. My fave is the towel hooks. 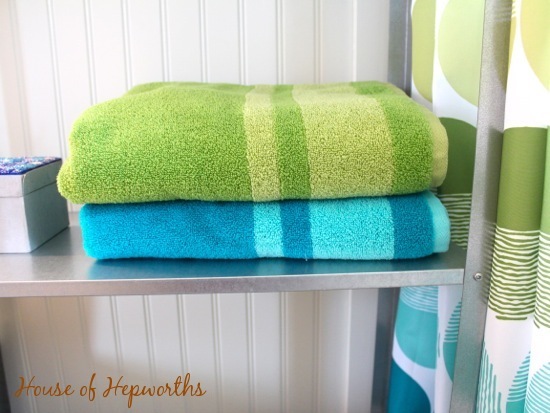 We have always had one long towel rack which only holds 2 towels so the rest get thrown over the top of the shower curtain (which I understand but abhor). I made you your very own board on my pinterest page (don’t look yet/ I need to do some editing) so keep up the good work! It looks awesome!! Way awesome job!! 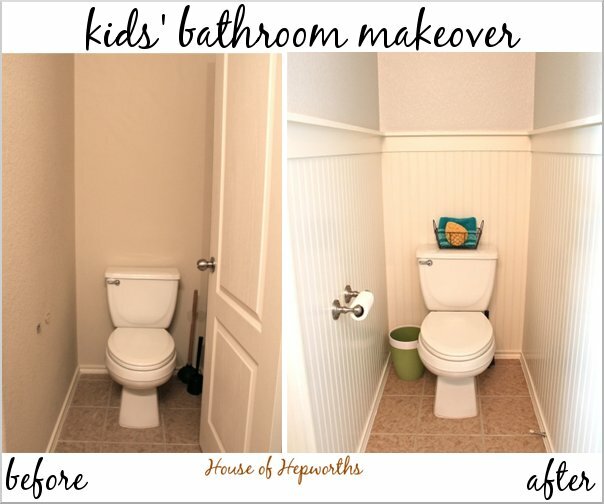 The color scheme is my favorite – I can see how your kids would just totally love it. 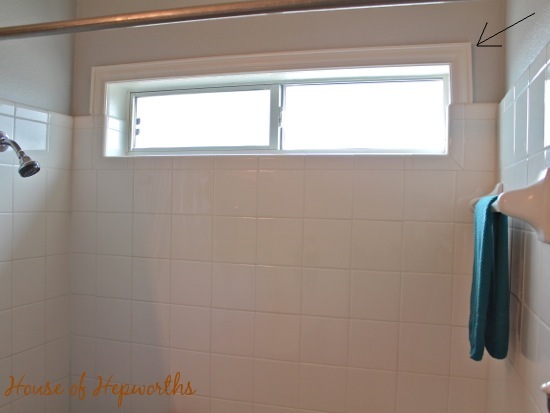 Love it- what do you think about framing out the window above the bathtub? It looks so good Allison! 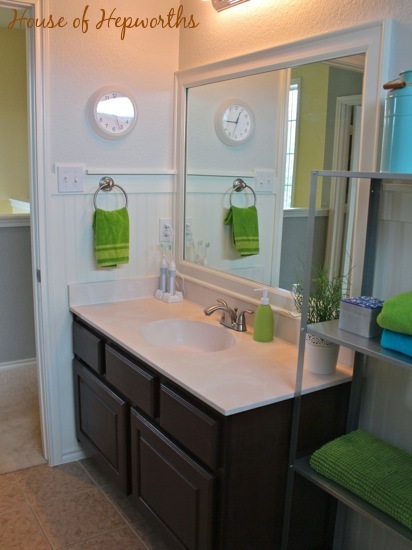 The colors are perfect and the bead board looks fabulous! Well, crud! I thought I had picked out the paint for my son’s room makeover and now I have to go get a sample of Heavy Goose 🙂 I had been thinking MS Sharkey Gray, but that color looks more like what I had in mind to begin with. Your bead board looks fabulous! Looks so good! 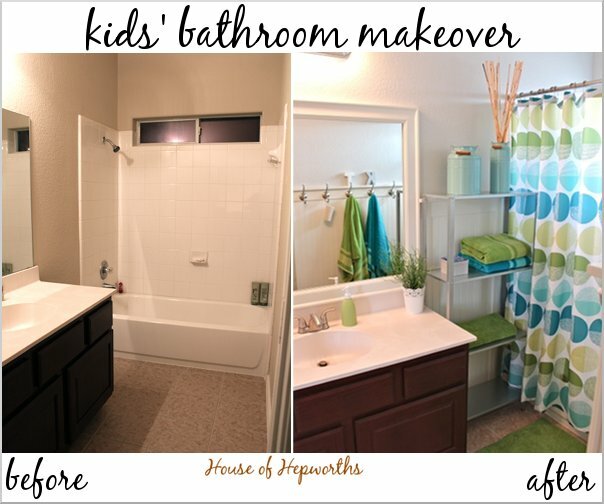 Love an awesome before and after!! This makeover looks great! I love the bright and cheery colors! Wow! 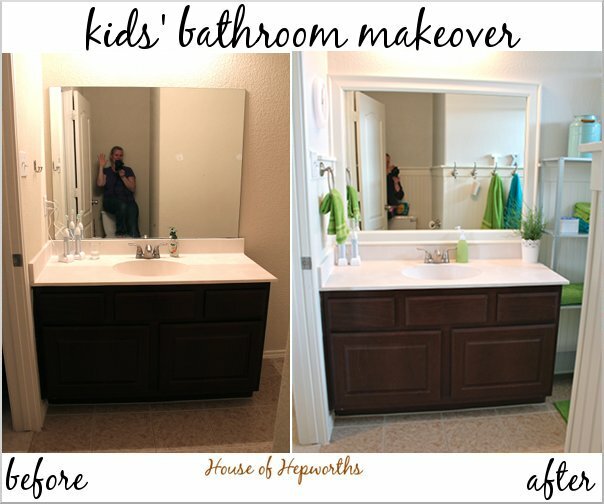 There’s so much to love in this makeover. 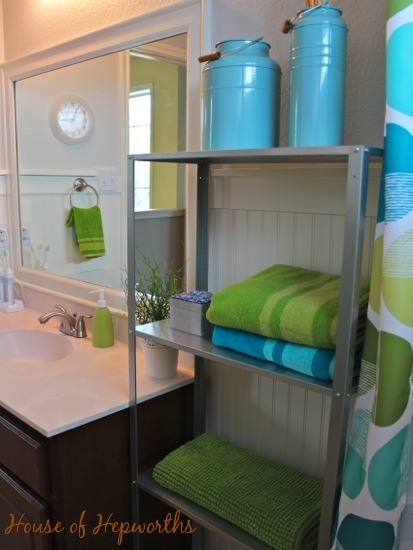 Love the color choice, and I really like the shelving between the vanity and tub. It’s pretty and practical. 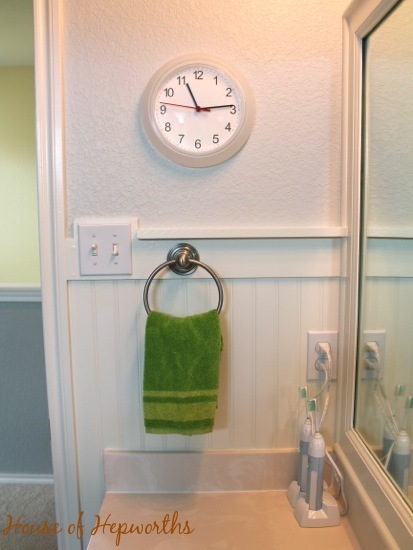 Oooooh, and I definitely need to put a clock in our boys’ bathroom too. Great job! LOVE the colors. 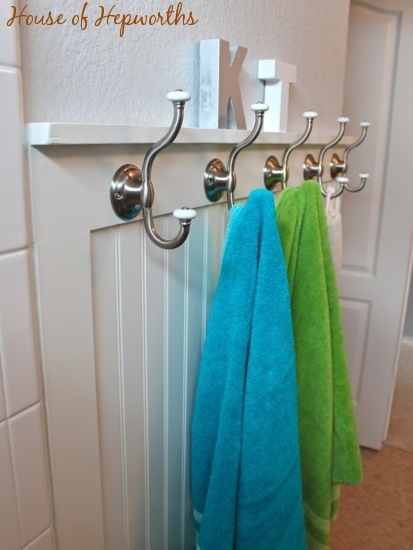 Also, those robe hooks are exactly what I want for our hall bath. Do you have a style or brand name? Love it! And way to knock it out super fast. The grey is really a great backdrop for those fun colors. Please do an update post when you find a cabinet for up there! I’ve been searching for one for the last year to no avail. The space available is just a bit smaller than most options, and I think your little nook is a similar size. I LOVE this bathroom! LOVE. 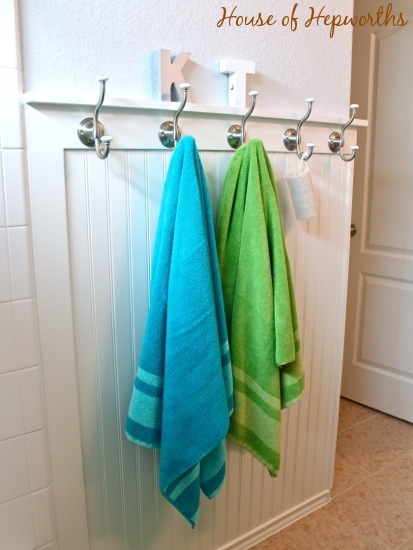 My very favorite is the robe hooks for towels- we went to hooks in our bathroom and in the kid’s bathroom and they so much better than towel bars. Yours are adorable! 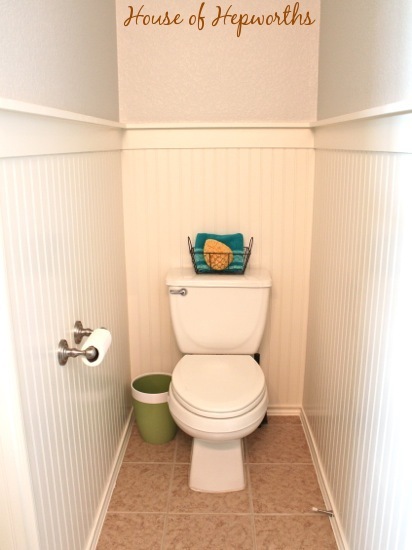 We have a water closet like that in our bathroom- we do have a cupboard above the toilet, but I think it makes the room feel even smaller- plus it’s awkward to reach necessities when you’re sitting. I also added a stack of decorative boxes (found at TJ Maxx) in the corner- I keep my lady products in one and we keep flushable wipes and a few other odds and ends in the other. Those get daily use and I’m so glad I added them! 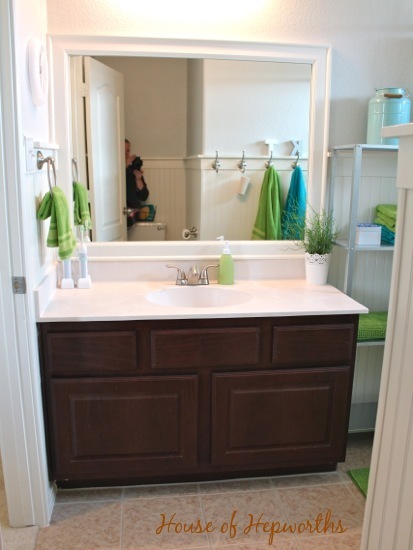 The other option is an open shelf with baskets for your tp and other stuff- easy to access, but sort of hidden too. Hi! The bathroom is fantastic! Looks great:) would you mind sharing the paint color on the walls? Thank you!